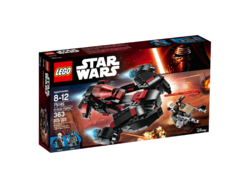 75145 Eclipse Fighter is a Star Wars set released in 2016. Surprise the Freemakers with Naare's transforming Eclipse Fighter! Jump Naare into the Eclipse Fighter and rendezvous with bounty hunter Dengar on his speeder. When he's not expecting it, transform the vehicle to reveal the hidden spring-loaded shooters! 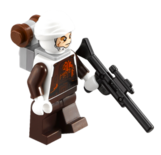 Includes Naare and Dengar minifigures. Features the Eclipse Fighter and a speeder. 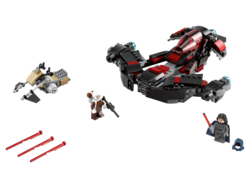 Eclipse Fighter features an opening minifigure cockpit, Lightsaber storage underneath and a transform function that reveals hidden spring-loaded shooters. Jump on the speeder and make a quick escape. Weapons include Naare's Lightsaber and Dengar's blaster rifle. Also includes Dengar's turban and Naare's hood and cape. Play out your own exciting adventures from the LEGO® Star Wars: The Freemaker Adventures animated TV series. Eclipse Fighter in closed mode measures over 2” (6cm) high, 7” (20cm) long and 7” (18cm) wide, and over 2” (6cm) high, 6” (17cm) long and 8” (22cm) wide in alternate configuration. Speeder measures over 1” (3cm) high, 3” (8cm) long and 1” (5cm) wide. Facts about "75145 Eclipse Fighter"
This page was last edited on 9 February 2019, at 22:02.